[prMac.com] Moscow, Russian Federation - Ivideon today is pleased to announce Ivideon Server 3.0 for Mac OS X, now providing Mac users access to the first free, international, cloud-based, video-surveillance web service - Ivideon Cloud. Compatible with most webcams and IP cameras, users sign up for a free, private account. With just a 10-minute setup, feeds from surveillance cameras at home or in the office can be viewed simultaneously on most desktop computers or mobile devices. Ivideon also offers a paid service for commercial customers who may require SMS notification, etc. Ivideon Server is a complete video surveillance solution for both home and business use. It is easy and economical to deploy, and users can set it up on a desktop computer using either a webcam or an IP camera. Once the video surveillance system is up and running, users can watch video from anywhere in the world via the Internet. Ideally suited for home use, Ivideon users can watch their home's remotely. Checking on the well-being of children or the elderly at home becomes easy, and users away from home will feel confidant knowing exactly what is happening at all times. In the workplace, webcam surveillance is a great way of keeping an eye on the situation at all times. Ivideon Server offers a completely free and high-quality solution, which provides all the main functions of a costly, standalone system. It provides a variety of powerful features as standard, including: live video, video archiving, sound recording, and more. To save bandwidth and disk space, it can be configured to automatically start recording when motion is detected. When there is no movement, the camera can automatically stop saving video to the hard disk until the motion-sensing algorithms of Ivideon Server turn the camera back on. Most existing surveillance solutions require at least some degree of expert knowledge and experience to set up. The Ivideon system, however, requires no special knowledge; users do not need to know anything about hardware and networking technicalities. They simply install the Ivideon Server application, connect cameras, and the free, online Invideo Cloud service provides flawless connectivity. "Our goal is to become recognized as the best security service available, the de facto standard for video surveillance over the Internet," explained Vladimir Eremeev of Ivideon. "You know there is a number one service for phone calls over the Internet - Skype. It is free of charge for Skype-to-Skype calls. And, just like Skype, Ivideon is also free of charge. This, combined with our continuous efforts to perfect our software, gives us lots of happy users, who spread the word about us everywhere. By making our free service ubiquitous, we hope to attract lucrative, paid, commercial accounts." 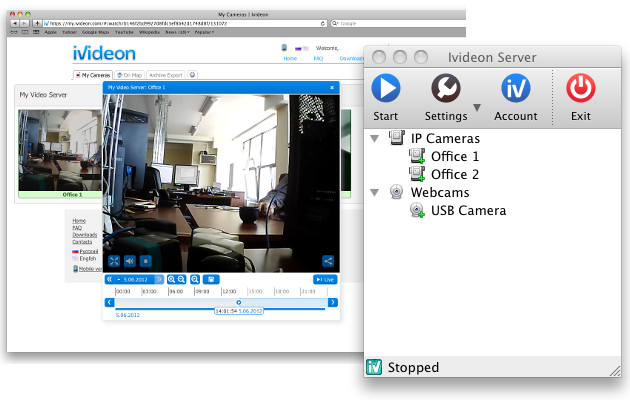 Ivideon Server 3.0 for Mac OS X 10.7 is available free directly from the iVideon website. Also available free is Ivideon Server for iOS, Windows, Linux, and Android. Based in Moscow, Russia, Ivideon was founded by Vladimir Eremeev in 2010. Ivideon has just reinvented Video Surveillance. It is their mission and their revolution. The small, highly motivated Ivideon team plans to replace all existing, old, heavy, and very expensive video surveillance systems. Ivideon is number one in Cloud Surveillance Service. Use all its software and services free to test the quality. Copyright (C) 2010-2012 Ivideon. All Rights Reserved. Apple, the Apple logo, iPhone, and iPod are registered trademarks of Apple Inc. in the U.S. and/or other countries. Other trademarks and registered trademarks may be the property of their respective owners.